Turning right at red lights is not permitted in Denmark, like it is in many other countries, including Germany. I don't actually know why or when this law was put into place (hint: please tell me if you know). 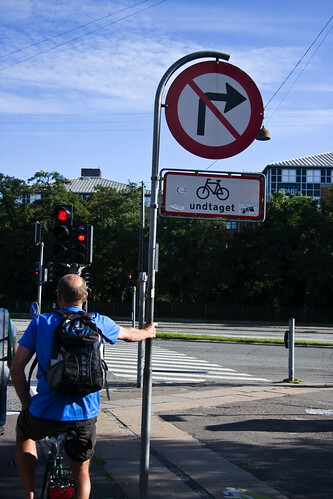 On occasion there are vague mumbles from the Danish bicycle advocacy wilderness about making it possible for bicycles to turn right at lights but little comes of it. Everytime I ride past this sign on Borups Allé I get a warm, fuzzy feeling. It reads No Right Turn (except bicycles). The warm, fuzzy feeling is often followed by a dismayed shake of the head, wondering why this isn't standard for bicycles throughout the Danish kingdom.